The CN Tower is to Toronto what the Eiffel Tower is to Paris. The tower captures one's soul with dazzling view of Toronto and the Lake Ontario. Beyond doubt, your visit to Toronto would never be complete without an ascent to the top of its most celebrated attraction and signature icon. Considered as one of the Seven Wonders of the modern world, it's the tallest free-standing tower in the world with staggering 553.3 metres (1,815 feet) high in the sky. Originally built to solve telecommunication problems in 1970s, today the CN Tower (also known as Canada's National Tower) is an absolute must attraction of Toronto and draws more than 2 million visitors each year from all over the world. Located on the north shore of the Lake Ontario, in the core of Downtown Toronto, exactly in between the SkyDom on its left and the Metro Toronto Convention Centre on its right, this Tower has become the centre of tourism since its opening in 1976. As soon as you get a first glimpse of the Toronto skyline, the mighty CN tower will catch your imagination. Part of any picture of Toronto's skyline, this lofty communications tower offers a bird's eye view of the city and also an inimitable dining experience at the revolving 360 restaurant on the top. And while the experience of standing atop the tower is an electrifying one, the ride up by glass-fronted elevator is a story in itself! You need to see it to believe the magic. Obviously, it's a great place for most of the visitors to kick off their Toronto trip and I hope it won't be different for you too! As you approach towards the tower, keep your camera and camcorder handy because there will be tons of opportunities to capture astonishing and gorgeous view! So without further ado, let's take a quick overview of various observation decks and other major attractions of the CN Tower. Taking the recently introduced glass floor paneled elevator up to the observation deck is an amazing and thrilling experience in itself. It provides visitors opportunity to see 346 metres straight down. It is North America's first and the world's highest glass floor paneled elevator. Purchase a Toronto CityPASS and visit 5 high-flying Toronto attractions for one low-price! Avoid most ticket lines! Save time and money. Valid for 9 days. It takes only 58 seconds to reach the indoor observation deck at 346 metres (1,135 feet) by one of the six glass-fronted elevators, travelling at remarkable speed of 22 kilometres (15 miles) per hour. In 2007, the elevator ride ranked # 1 on the World's Top 10 Elevator Rides by National Geographic. This will be first destination of your upward journey of the Tower. Located at 346 metres (1,135 ft), this observation deck is an ideal place to have 360 degree panoramic view of the city. In addition to the lookout facility, this observation deck houses Horizons Restaurant. You can tickle your taste buds with fine casual dining and also enjoy magnificent view of the city from this restaurant. Reservations are not required at Horizons Restaurant. Sky Pod is a small observatory at astonishing height of 447 metres (1,465 feet). It holds distinction of World's highest man-made public observatory and offers stunning view from the top. If you are fortunate enough, you can see as far as 100 - 120 kilometres away, to the city of Rochester in United States or the Niagara Falls on a bright, sunny day. The view from top is really a feast to the eyes! What a pleasure! What an exciting feel! If you miss spectacular view from the Sky Pod, you miss everything. Probably, the Glass Floor is the most popular and exciting attraction of the CN Tower. Step on the see-through Glass Floor and I am sure you will get dose of Adrenaline Rush. The first of its kind in the world, the Glass Floor gives one of the weirdest experiences you will ever have! You can get the street view from 342 metres (1,122 feet) straight down standing on 2.5 inches thick Glass Floor. Wow, what a bizarre experience! Don't be nervous. The Glass Floor is five times stronger than the commercial floors and can endure the weight of 14 giant hippos. And load tests are carried out regularly once a year to ensure the safety of the floor. So hold your breath, muster some courage and step on the glass floor to have that amazingly wild experience of your life. There is also an outdoor observation desk at this level. You can enjoy the same magnificent view with cool breeze from this deck. The 360 Restaurant offers sophisticated dining experience along with spectacular view. The floor of the restaurant rotates 360 degree once every 72 minutes giving unobstructed view of the city and Lake Ontario. You can also sip your favourite wines at the World's Highest Wine Seller, 351 metres high in sky. If you plan to enjoy a meal at this restaurant, you have to make a reservation in advance. I suggest you to visit the restaurant in the evening for dinner, the view is really gorgeous. The food is a bit expensive here, but if you make advance reservation and purchase a main entr�e, you get complimentary elevator ride to 360 Restaurant, the Look Out and Glass Floor. While the CN Tower offers an amazing view and a memorable dining experience from the top of Tower, at the lower level the Tower has an array of attractions including interactive rides, movie and shopping for the visitors. You can enjoy the incredible environmental journey at Himalamazon! Experience the adventure of this motion theatre ride, complete with special effects. The ride instigates ecological awareness by portraying the environmental disaster, that mankind faces, through years of over-harvesting the forests. Kids below 107 centimetres (42 inches) are not allowed for this ride. If you are curious about the technical aspects and construction details of the CN tower, you must see The Height of Excellence at the Maple Leaf Cinema. It's a 15 minutes documentary film, unfolding the construction of this colossal engineering marvel. Or if you are running out of time, you can buy this documentary film from the Marketplace retail shop and watch it later at your home. For the shopping lovers, there is a huge 10,000 square feet Marketplace at the base of the Tower. 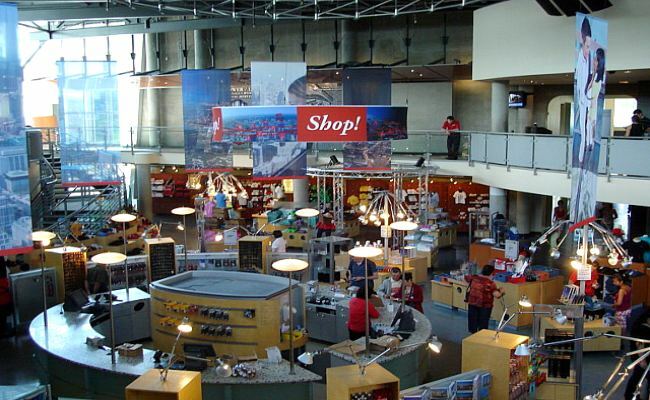 The Marketplace offers authentic First Nations art and crafts merchandise, sports merchandise and unique CN Tower souvenirs. Buy a tiny memento of the Tower which will keep your wonderful memories of the trip always fresh. Or if you are hungry, get a bite of your favourite pizza or sandwiches at Far Coast Caf�. You can also enjoy specialty coffee, tea, and cocoa - Adventures By the Cup. Watching the CN Tower at night is entirely different experience all-together. The elegant night time illumination is really an awe-inspiring. It's icing on the cake! 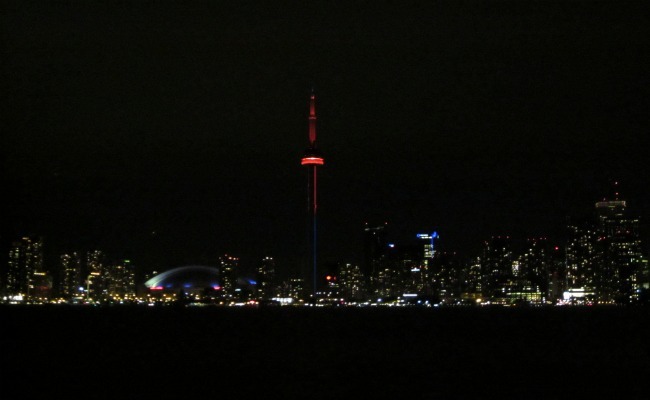 The CN Tower literally lights up the Toronto skyline each night vividly illuminated in red and white. The Tower's unique architectural lighting features 1,330 energy efficient, innovative programmable LED fixtures. The Tower installed an intelligent LED illumination system in 1997. The new state-of-the-art lighting system is energy efficient, cost efficient and provides several other unique benefits. If possible, prefer a bright and sunny day to enjoy the clear and far-flung view from the top of the Tower. You can check the latest Toronto weather to make sure you get some sunshine on your trip to the CN Tower. Usually, it takes 2-3 hours to go and enjoy all the observation desks entirely (waiting time extra). So even few hours of sunny break on cloudy day will be more than enough for you. Buy your tickets online to avoid the ticket queue. Go early in the morning to avoid long queue. Or if you want to enjoy both day and night view, go 2 - 3 hours before the sunset. It costs $2 to use the binoculars installed on the observation decks, so keep some loonies and townies with you. Once you insert the coins into the machine, it allows you to use the binocular for duration of 3 minutes. Or bring your own binoculars, if you have. The CN Tower is open 364 days a year (closed on Christmas Day). Operating hours are adjusted seasonally. Please note that price doesn't include any taxes. You will be charged the 13% HST on the listed price. Tip: Your best bet is to buy Total Tower Experience package which includes all the observation decks, documentary film and motion theatre ride. This package will save you 30%. You can purchase the tickets online at https://secure.ticket-ops.com/CN_Tower/eDirect or at the main entrance of the CN Tower. Your ultimate destination is Union Station. From there, the Tower is a short walk west along Front Street, or a 5 minute covered stroll along the SkyWalk. From the South or West - Follow the QEW into Toronto, where it turns into the Gardiner Expressway. Exit onto Spadina Ave. North and turn right onto Bremner Blvd. From the East - Take Highway 401 into Toronto and exit onto the Don Valley Parkway Southbound. As you approach Downtown, this will turn into the Gardiner Expressway. Exit at Spadina Ave. North and turn right onto Bremner Blvd. From the North - Take Highway 400 into Toronto, exiting onto Highway 401 West. Continue until you reach Highway 427 southbound. Follow Highway 427 to downtown via the QEW/Gardiner Expressway. Exit onto Spadina Ave. North and turn right onto Bremner Blvd. Parking: CN Tower doesn't have onsite public parking lot. However, you'll find lots of parking all around the CN Tower. Most of them charge $20 flat for 24 hours of parking.